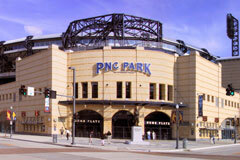 David Greusel has designed stadiums for major league teams including the Pittsburgh Pirates and the Houston Astros. Yet this principal architect at Convergence Design in Kansas City, Missouri, suffered for years under the message that his work didn’t matter. “It’s all going to burn anyway,” he heard from fellow Christians. “The only thing that lasts is the human soul.” Dualistic evangelical theology taught Greusel that designing buildings had no value, especially designing the kind of sports architecture that is his specialty. Only in the last five or ten years has the architect felt confident in his vocational calling. “God has called me to be an architect, to design buildings for people and communities and that’s what I’m supposed to be doing. That’s my ministry,” said Greusel.